Professional educators can take a wide range of paths within the field of education, including becoming a reading specialist. A reading specialist, also referred to as a literacy coach, helps schools improve their literacy rates. They also perform other related tasks as needed by the district and individual schools. Like other educators with specialized positions, a reading specialist must obtain appropriate licensure and training in order to work in public schools. Actual job responsibilities may vary by location, but this specialized career path involves enhancing a school’s curriculum to improve reading and literacy. 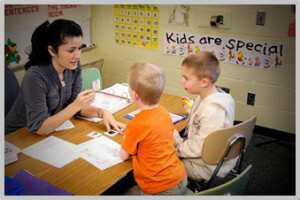 According to the International Reading Association, a reading specialist or literacy coach primarily “supports, supplements and extends classroom teaching” and devises “a quality reading program that is research-based and meets the needs of students.” Reading specialists are trained to recognize problem areas, evaluate existing curriculum deficiencies and implement customized solutions to address ongoing issues. They work with teachers and principles to address gaps in reading education, and they help shape the curriculum in a tangible way. To become a literacy coach, educators need to hold a master’s degree with certification as a reading specialist. Literacy coaches take a specialized Praxis exam to demonstrate their proficiency. The Educational Testing Service or ETS offers a guide for what’s covered on the Praxis exam for reading specialists. Eighty percent of the test covers pre-selected topics on issues such as leadership skills and specialized knowledge while the remaining 20 percent focuses on constructed-response questions on professional learning and leadership, and an analysis of an individual student case study. Reading specialists can change the dynamic of an individual classroom and the overall performance of a school. Students with disabilities, those who struggle with literacy and kids who receive no additional instruction at home will benefit from professionals who are trained in this area. Not only does a reading specialist need to understand the pedagogy involved, but he or she should understand the emotional and psychological factors that influence literacy rates. According to the U.S. Bureau of Labor Statistics, instructional coordinators, whose job responsibilities mirror a reading specialist’s, earned an average salary of about $60,050 in 2012. By 2022, the demand for people in this industry will increase by 13 percent, about as fast as average for other occupations. Those who work in schools to help teachers plan and implement effective curriculums have a lasting impact on individual students as well as school districts as a whole, and a reading specialist in particular plays a vital role in shaping literacy rates within the community.